Yes, dear Asher, and thanks for that discussion. But I am more concerned today with mundane matters like meteorological patterns in the Northwest. That is, temperature and precipitation in a very basic sense. It just doesn’t seem very much like autumn to me. On September twenty-third it did rain, which was promising after a very hot and dry summer that continued into September. But I don’t think it got below the upper sixties. 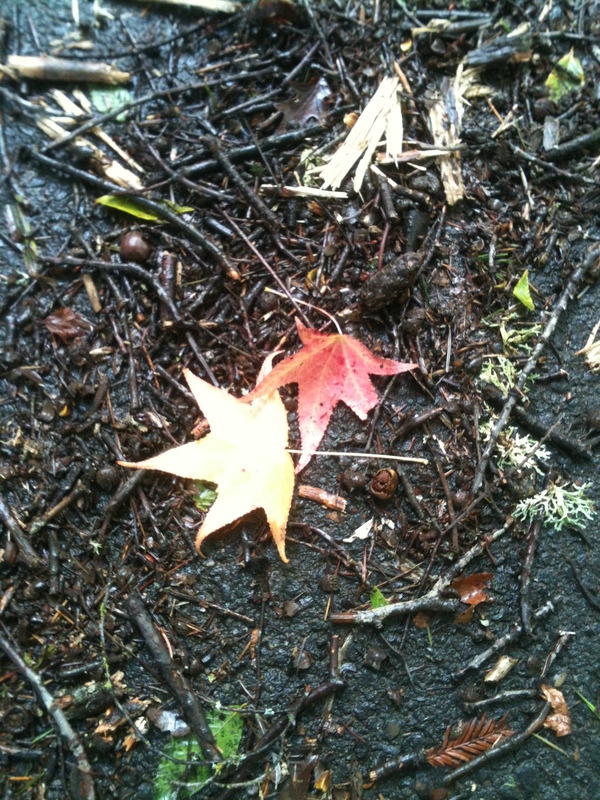 Not that I’m really complaining, just stating the manifestation of fall in Portland, OR. The sun keeps beaming. Today it hit eighty. I wore sandals with jeans and cotton shirt and felt overdressed. I had an urge to change over my closet for winter clothes earlier in the week. But what’s the sense of that when I must wait until it rains for a couple of weeks straight and the temperature shows low sixties or lower at least that long? Still, I did pause over my quilted green jacket and teal fleece today. I’m getting antsy to wear them both, as well as three pairs of boots. I’m done with painting my toenails mauve; they want socks and my old slippers. I keep waiting for fall to make its entrance with a flourish. The heavy rains to shutter me in the house a few hours until I get readjusted. The heat to be turned up a tad. The windows to be cracked enough to let in the intoxicating smells of wet earth and city but no so much that hands and feet freeze. I have a circulatory condition called Reynaud’s; my extremities become painfully cold at around sixty degrees (or if I hold onto something cold or frozen for more than a few seconds). Even in our generally mild winters I get to wear fingerless gloves and always have warm socks on. But it’s okay with me. I love the rainy fall–what we have of it. It turns into winter almost without our noticing it. Except for digging out fleece vests, a couple water-repellant items. Well, I am mostly okay with this. I was shopping earlier today and about stopped mid-traffic to look at the two big trees with leaves turning red amid the barely burnt-orange and cheerful green. The shock of color scooped up my psyche and carried me home. Way back home to the Midwest, where I was raised. That kind of fall–like all four seasons there–meant special performances of the theatre of Nature. Being of a dramatic bent, I appreciated that even as a child. Cold, sometimes face-whipping rainstorms, winds that bore down on the land with a wail and drops in temperature that got me by the neck and chest on the way home from school. Dressing in many layers was the key; one had to be prepared or pay the consequences. Our mothers just dressed us protectively against whims of nature we kids found fun. Fall and school meant shopping for wool skirts and sweaters, boots, rain coats with a heat-supplying zippered liner and mittens. In other words, preparing for the inevitability of a serious sleet storm or winter snow by Thanksgiving at latest. The whole point of which was to allow me to go outdoors, to walk to school and back, and to play. Being outside each day was a priority after school and all week-end. Indoor activities included school assignments, cello lessons and hours of practice, board games with family, reading and writing for fun, church activities and chores. (We didn’t even have a television until I was thirteen, not for financial reasons but because my parents didn’t want one– and then we watched the news occasionally, not much else. But that’s another post.) Being outside was a relief for me, a kid who wanted to be as active as possible. Besides, in autumn, everything smelled better, seemed interesting, looked amazing. The swift, edgy breezes enlivened me, shook any shred of boredom right out of me. It grazed my pallid cheeks, made them bloom rose. The light underwent a subtle but striking transformation, as if clarified as it shot through chilly daybreaks. Strengthened, although the air wasn’t droopy with heat like summertime. It intensified hues, whether it was brilliant leaf coloration or the mutinous gray of thick nimbus clouds. 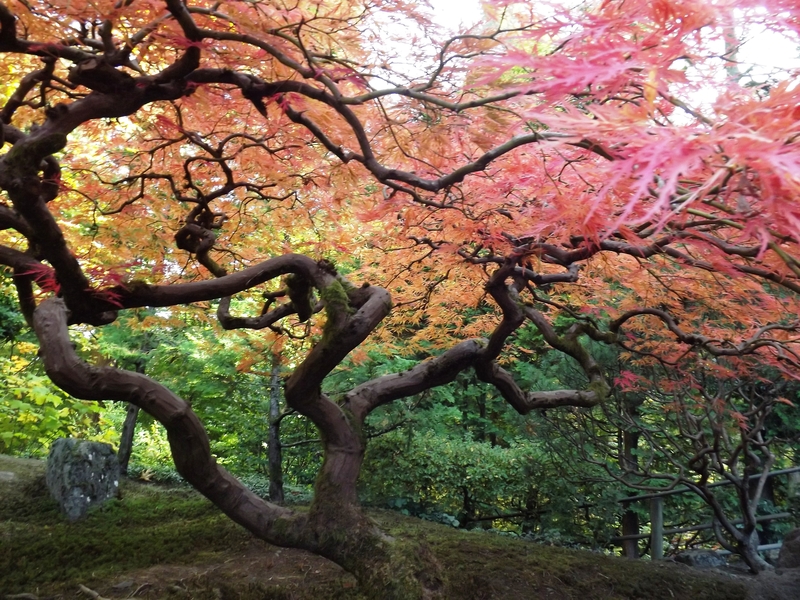 On bright blue days I remember just sitting in the crook of the old maple and looking hard, my eyes absorbing the panorama. Making it indelible within me. That smell of falling, then fallen, broken leaves–do you know it? It is pungent and thick when you breathe in; it almost tastes of trees’ lives lived well. I know, they’re dead leaves, all used up. But that sound? Happy. The leaves underfoot seem to rouse themselves, make a shushing sound that is brittle and bright. When they’re raked, the cool, damp underside of the pile oozes out musty but sweet. Jumping into piles of them creates instantaneous laughter and screaming. And when flame is put to a pile, the scent carries for blocks, lingers in the nose, is carried into houses on hair and skin, clothing. A leaf bonfire at night is something enchanting: it draws people and keeps them there, enamored of life, of that very moment. My Midwest autumn meant riding bikes as long as possible, before rainstorms howled, then sleet and snow raged. It meant the last of kick-the-can in back yards. Fall was full of trickiness, with temperatures that fluctuated wildly until it settled on way too cold, then freezing. It called for the unfurling of scratchy scarves in gusts, the donning of hearty hats–and all the while the trees disrobed, one by one. I remember those autumns so well that I can see my younger self running through the yellow, orange and red piles. Later, curling up with steaming hot chocolate by the window while leaves twirled and twisted, released by their months-long keepers. I grabbed a book and a blanket and settled in. I knew winter was on its way. I was ready. It was nearly eighty here today. This is a bit surprising but it stays warm here way past when Midwesterners would expect. Fall is within reach when it starts to ping-pong between twenty degree differences and the numbers start to make more sense. And when rain returns like a grumpy but entertaining old friend. Not big storms, usually, not accompanied by the siren call of biting winds. Just “the rains”. Every couple of days, then gradually it stops playing around and it becomes most days before the winter daily rains. Such royal rain. Sporadic dripping and spitting, misting and soaking wetness. A reverence for rain comes upon me. It is a daunting yet beautiful half-year of it. The flowers turn their faces upward all winter. The grasses offer an emerald swath of life spread out for humans and beasts. I have learned how to hike in the rain; the forests are a wealth of mosses and conifers and more. I care for the Northwest so much that at least once a week I ask myself why I waited so long to live here. It has been twenty-one years. But that doesn’t mean the Midwest autumns have faded away. There are different, perhaps fewer sorts of deciduous trees here. I long deeply to witness more of their cycles, the alchemy of foliage coloration. I want a bonfire at a lake, leaf piles to get lost in, the stinging wind zooming in from the North. I dream of it sometimes, this left-behind place. Its complexity of seasons. Its power to bring me to a sudden stop in the street. I breathe in and smell it: a Midwest fall is like a fine perfume, a balm. But when the rains return I will be relieved, despite the enjoyment of extended warmth. I will get out my gloves and make my way down sodden pathways. The fallen leaves will glisten in the soft, damp shimmer. I will be at peace in this rainforested land, as I was in that autumn-leaved country now far from here. Ah, Cynthia, the smell of autumn finally arrived here. One day it was bright and hot and sunny, a vestige of summer, and overnight the rains came and the next morning was cool and damp and leaves covered the ground. That nostalgic autumn smell arrived. What a wonderful post about the many connections we have with the change of the seasons, whether they are physical, emotional, or memories. Thank you! Thank YOU, Composer, for reading and finding a connection of your own. How lovely that you are enjoying your own autumn now. Yes, there does seem to be a bit of nostalgia attached to seasons via memories of childhood, in part. 🙂 I have enjoyed your posts, as well, and will return soon.